Industrial Internet of Things (IIOT) and as a manufacturer, why you should be interested? Internet of Things (IOT) has swept everyone off their feet and is the most trending subject among industrialists, tech geeks, manufacturers, industry thought-leaders, innovators etc. It has changed the way factories and business establishments operate their units. Operations are monitored real-time, proactive measures are taken before probable breakdowns/incidents, data is collected and analyzed for business & production process improvements, efficiency has increased and so is the profitability. Of all the industry-lot, manufacturers have seen immense benefits from IOT. In industrial terms, it’s referred to as Industrial Internet of Things (IIOT). Manufacturing being the top-most industry segment in US, it has spent an estimated $178 billion in the year 2016 and the number is only going to increase further to $183 billion in 2017 (Source: IDC). How does IIOT transform manufacturing? As a manufacturer, why is it so critical for you? And if you haven’t paid attention to it, why you should do it now? Machines – machine health & performance, start/end time, personnel login details, job details, scrap quantity etc. Inventory – current warehouse location, batch details, real-time BOM etc. Logistics – Shipping status, cargo location, truck/flight details etc. The collected data is analyzed and converted into meaningful reports that provide real-time analytical information to various section of the business unit such as the shop-floor, procurement & logistics, plant operations, sales & marketing, management etc. Based on this, decisions are taken quickly, problems are solved immediately or before they occur, customer behavior is analyzed, sales forecast and production planning is formulated accordingly, inventory maintained is optimal, and overall operations are smooth. IIOT not only impacts a single process but the entire chain. Let us take a look at the most-impacted areas in manufacturing. Out of the estimated total spending of $178 billion in IIOT, a little over $100 billion was spent on manufacturing operations. That’s a whopping 56% and indicates the need to streamline operational processes and techniques. Manufacturing operations consists of multiple processes such as planning & scheduling, MES, quality control & management, asset and inventory management, compliance management, Human-machine interface (HMI), manufacturing intelligence, machine performance, R&D management etc. that encompasses man, materials, machines and workflows. 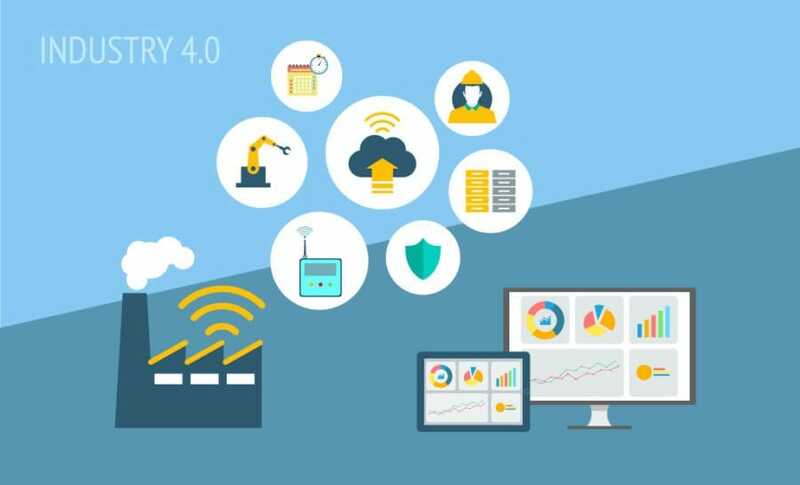 Implementing IIOT in manufacturing operations involves connecting these process elements to the digital network, integrate them with each other, build a common information framework that helps them seamlessly communicate with each other irrespective of the technology/domain used. Equipment-based sensors, machine monitoring technology, advanced analytics has redefined manufacturing operations and accelerated production and decision-making. These technologies provide real-time visibility of production, machine status, job processing, personnel status etc. The data collected from each sensor is converted into meaningful information for each department that helps them to realize changing customer preferences, improve business processes, product quality, reduce costs, optimize production and increase profitability. Keeping a close track of inventory and maintaining optimum inventory levels is a major challenge for manufacturers. Sensors and bar-code technology helps them keep track of raw materials right from procurement till they go into semi-finished or finished goods. This real-time data also helps manufacturers to look out for patterns that can be used to tweak production processes, inventory management and reduce costs. Real-time updates to BOM helps manufacturers to trace raw materials, semi-finished goods even after products are sold. This makes product recalls easier and quicker thereby reducing costs, maintaining reputation and customer trust. Supply Chain Management is another critical area for manufacturers. Imagine a scenario where your suppliers know that you will run out of a particular product within a stipulated period of time, they quickly issue a sales order that becomes your purchase order and immediately dispatches the product-batch slated to reach you before your stocks deplete. That’s precisely what IIOT does to the supply chain. It interconnects your plant with the suppliers so that they get direct visibility into your inventory levels and dispatch orders even before you create one. Imagine the time saved and speculated production costs. With IIOT, manufacturers can easily keep track of their production assets. Machines and peripheral devices are retrofitted with measuring equipment such as vibration sensors and temperature-readers depending on the nature of machine and data to be captured. These devices constantly measure the required parameters and in case of deviations, throws an alert for the supervisor. This way, the problem can be tackled even before it arises and completely eliminates possible downtime, associated costs. Apart from implementing preventive maintenance, this also helps determine overall OEE and optimize production levels. IIOT devices help manufacturers to increase production yield per machine. Machine monitoring devices relay machine data continuously and provide real-time view of what processes they are running, whether they are idle or have suffered a breakdown. In case of a machine being idle, shop-floor personnel can immediately allocate a job thereby making optimum use of machines available, reducing delay in production, and ensuring on-time delivery. Multiple orders that have similar product requirements can be run on a single machine thereby increasing yield. Coming out of the factory, IIOT affects your customers in a big positive manner. Embedded intelligence into products (that are now used by customers) constantly supply you with performance data that helps you to note critical shortcomings, deviations and fix them immediately. Also, ensuring that the next product-line/version is free from the identified issues. It also helps monitor service, warranty and notify customers of an upcoming service. IIOT helps manufacturers to proactively address problems, build reputation and trust with customers. IIOT or Industry 4.0 is truly the 4th Industrial revolution. It has the capability of bringing manufacturing back to its glory days not only in US but across the globe. As the cost of remote sensors, IIOT devices and overall implementation costs go down, its adoption will only increase with more and more manufacturers specially from the Small & Medium segment jumping into the wagon. A smart factory will lead to smarter products. With most of the manufacturing issues taken care of, manufacturers can increasingly turn to product innovation and bring about a sea change in the lives of customers, and overall economics of the nation.